Delhi Youth Summit on Climate Change (DYSoC) is a pioneering Delhi Greens initiative towards engaging, inspiring and training the youth for taking up Environmental Leadership. The Delhi Youth Summit on Climate (DYSoC) is a two-day Environmental Leadership Training Programme, where the youth are empowered with information and skills that can help them protect the local, regional and global environment. Each DYSoC event concludes with a Green Youth Charter developed by the youth as a blueprint for ensuring sustainable development. 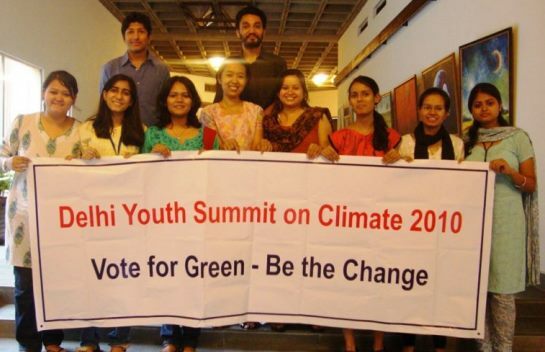 The first Delhi Youth Summit on Climate Change took place in the year 2008. This was an important year for Youth Action on Climate Change since the Theme of the United Nations International Youth Day in 2008 was Youth and Climate Change: Time for Action. Delhi Greens has organised the following four Delhi Youth Summits on Climate Change so far. The most recent DYSoC was organised in 2018. The next DYSoC will be organised in 2020. 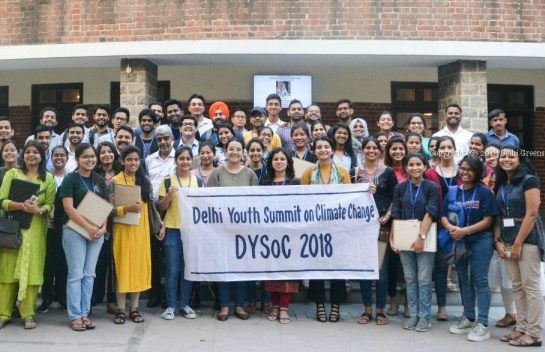 The Fourth Delhi Youth Summit on Climate Change (DYSoC 2018) was held on 3 and 4 October 2018 at and in collaboration with Miranda House, University of Delhi. DYSoC 2018 was themed on Urban Sustainability and Climate Resilience. The keynote speech during DYSoC 2018 was delivered by Padma Shree Awardee Shri Anil P. Joshi. DYSoC 2018 witnessed the participation of over 80 pre-registered youth delegates from across Delhi NCR. The Green Youth Charter that emerged from DYSoC 2018 is a blueprint for ensuring urban sustainability in the Indian context. The Third Delhi Youth Summit on Climate Change (DYSoC 2013) was organised by Delhi Greens on 24 and 25 August 2013 at and in collaboration with Miranda House, University of Delhi. The theme of DYSoC 2013 was Water and Sustainability. The keynote speech during DYSoC 2013 was delivered by Padma Shree Awardee Ms. Sunita Narain. DYSoC 2013 urged the youth to Be the (green) change they wished to see in the world. Through the support from Dataserv APAC, it also promoted the setting up of E-waste collection centres in colleges and institutions to avoid the toxic fallout of this hazardous waste. The Second Delhi Youth Summit on Climate Change (DYSoC 2010) was organised on 5 and 6 June 2010, and also promoted the celebration of the World Environment Day on 5 June. 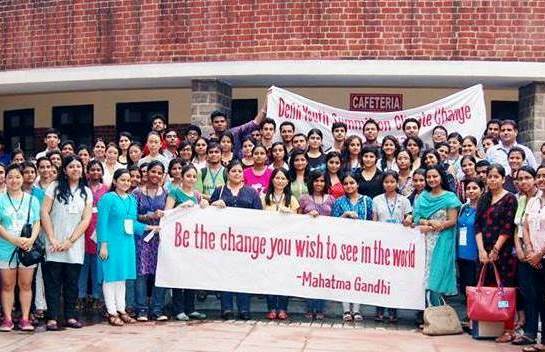 DYSoC 2010 was also hosted at and in collaboration with Nehru Memorial Museum & Library (NMML). The theme of DYSoC 2010 was Urban Biodiversity since it preceded the hosting of the Conference of Parties (CoP) to the Convention on Biological Diversity by India. DYSoC 2010 successfully highlighted the need for mainstreaming environmental and biodiversity related issues in the political discourse. DYSoC 2010 brought together youth from across India and became a National Youth Leadership platform for environmental protection. Youth delegates from the Summit went back to their respective colleges and initiated environmental projects and campaigns, which were subsequently highlighted by the Delhi Greens organisation to raise greater environmental awareness. The first Delhi Youth Summit on Climate Change (DYSoC 2008) was organised on 28 and 29 May 2008 at and in collaboration with the Nehru Memorial Museum & Library (NMML), Teen Murti Bawan – the residence of India’s First Prime Minister Pandit Jawaharlal Nehru. 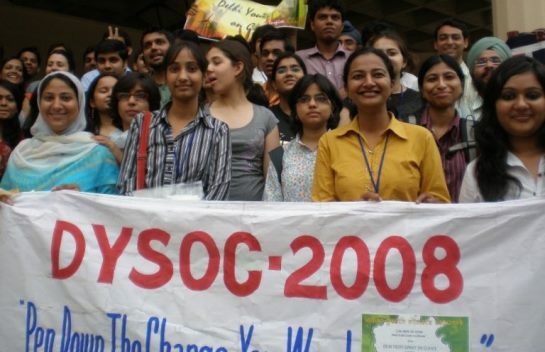 The Theme of DYSoC 2008 was the same as the theme of the International Youth Day in the 2008 – Youth and Climate Change: Time for Action. The objective of DYSoC 2008 – at a time when our source of information on climate change was the western media – was to generate awareness and inspire and empower the youth to be able to take action. DYSoC 2008 saw the participation of over 80 pre-registered members and an equal number of observers comprising citizens from Delhi and beyond. The keynote speech during the Summit was give by Mr. Bittu Sahgal, Editor, Sanctuary Asia Magazine. DYSoC 2008 concluded with a Delhi Youth Charter on Climate Change which was presented to Mr. J.K. Dadoo, the then Environment Secretary of the Government of NCT of Delhi. Mr. Dadoo welcomed the initiative of the youth for clean, bright today and a more secure tomorrow. Shortly after the submission of the Green Youth Charter to the Delhi Government, Delhi became the first Indian state to launch an Action Plan on Climate Change. DYSoC 2008 paved the way for launching the Youth Climate movement in the country.